If you ever spot Jenny out and about, take a look around. There’s sure to be a tall, handsome fellow somewhere in your midst. (Sorry, ladies – he’s taken!) Ron Doan, aka Mr. Jenny, is Jenny’s #1 fan and devoted husband. Over the years, Ron has developed quite the talent for quilt design, and this week he is in the studio with Jenny to demonstrate his latest creation, the Amplified Quilt. This quilt is a modern half square triangle pattern that is as eye-catching as it is easy. Click HERE to watch the tutorial! Geese are well known for flying in neat little v-shaped formations. It’s orderly, it’s predictable, aaand…it’s a tad stuffy, don’t you think? Why not throw caution to the wind and give those geese a little freedom to roam? Turn up some sweet tunes and pass out a few fancy drinks just for kicks; really let those birdies shake a tail feather! This week’s Tangled Geese Quilt is a fun take on the traditional Flying Geese. 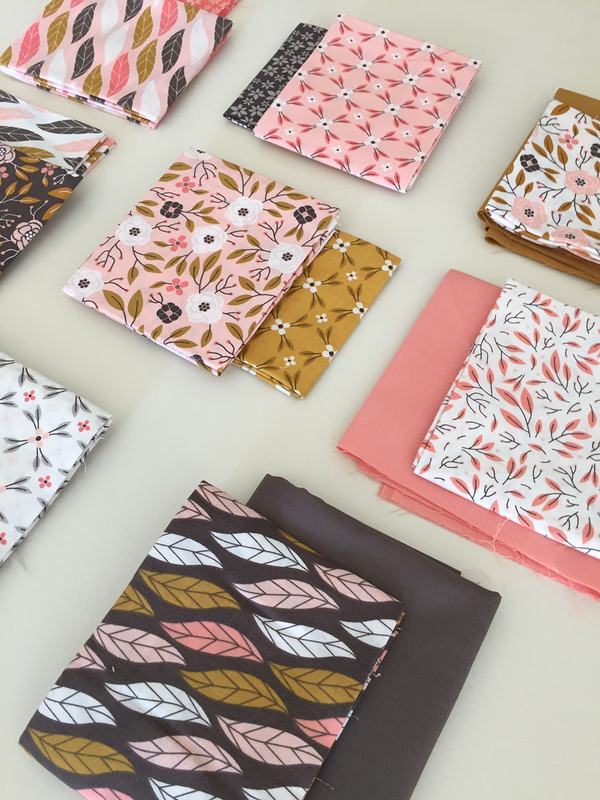 Add a little spice to your Flying Geese repertoire by trying out Jenny’s Tangled Geese Quilt! Click on the button to watch the tutorial and see everything you need to make your own Tangled Geese Quilt! The Rising Star Quilt is so striking, yet so simple to make (aren’t those the best?)! This simple block was created by Mr. Jenny (Jenny’s husband Ron) and you’ll hear all about that in the video tutorial. You will also see some different ways to arrange the blocks to create a completely different look! Hi Y’all. I’m Cristina Tepsick from Pretty Little Quilts and I’m really excited to be here today! I’m a mother of three, an active duty member of the US Air Force, and a quilter. I started quilting a few years ago to occupy my time when I had to be separated from my family, and although those months were miserably lonely, quilting gave me a tangible way that I could express my love for them. It makes me teary just thinking about it, but I don’t want to depress everyone, so let’s get started with the tutorial! Today I’m going to be showing you what I did with Jenny’s Broken Bars tutorial. When I was looking at her quilt it reminded me of rows of books. I absolutely love reading, so I knew this was the project for me. It’s such a simple project that yields some amazing results. I used a fat quarter bundle of Magnolia fabric by Camelot Designs, and coordinated it with some Bella Solids. Although this fabric is modern, the warm color palette and florals really give it a romantic feel, and in the quilt it reminds me of a Jane Austen library. 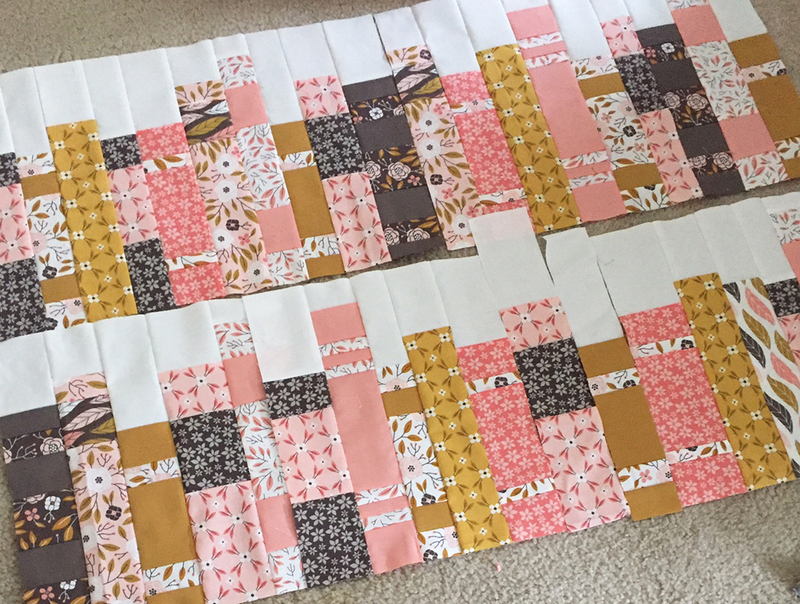 To make the quilt, I first took my fat quarters and paired them up in sets of two. 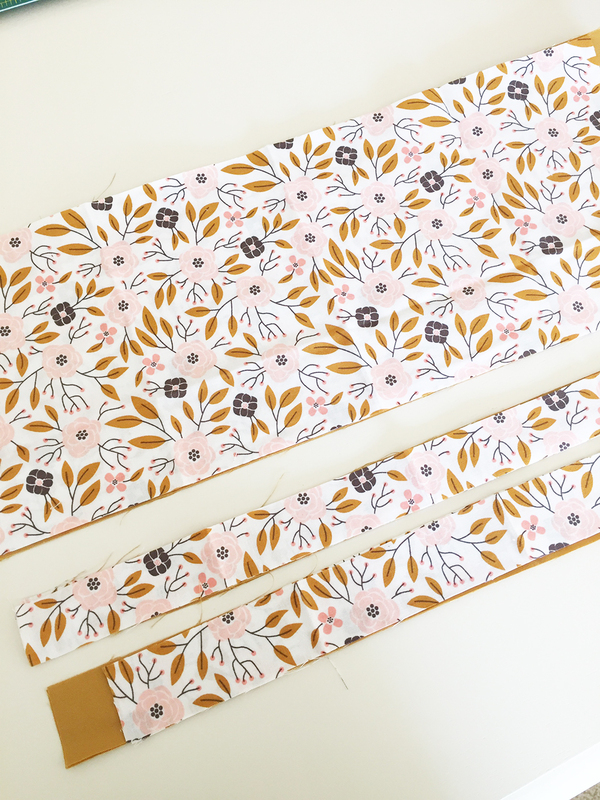 Then I cut the pairs of fabric into strips between 7-11 inches. 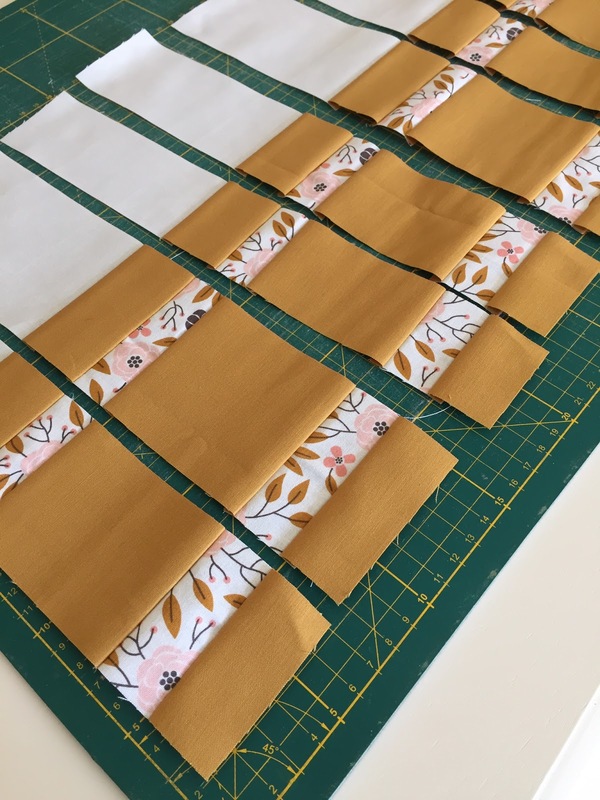 In Jenny’s tutorial you’ll see how she made hers into 10in strips and I used her method, with the exception of changing up the sizes. 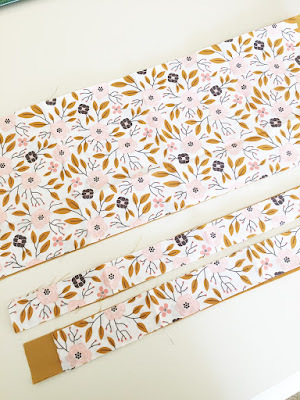 You really want to vary your strip sizes of your patterned fabric to give it that authentic bookshelf feel. First took a set of 10in strips. Then I cut some 1 1/2in strips off the bottom. Once you have that all together, just use your ruler to cut your “bars”. I varied the width of each of mine from 2in-3 1/2in, but the great thing about this project, is there are no specific rules, so you cut them however you like. I made each of my strip sets different, and the funnest part was sewing them together into blocks. 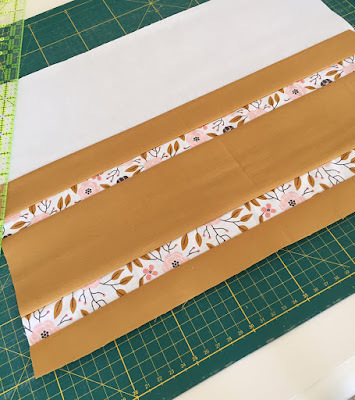 A good tip in Jenny’s tutorial that I would like to emphasize is deciding how many bars (or books) you want in each block, because the more bars you add the wonkier it gets. Each of my blocks were 10 bars (or about 20 inches) and I had used two per row. Then the hard part was done. It’s a no borders quilt, but you could absolutely add borders or strips of fabric between each row to make it look more like a bookshelf. This was a really fun and easy project and I hope it gives you some inspiration for making your own quilt!! To see more of my work you can follow my blog, Pretty Little Quilts, or follow me on Instagram @prettylittlequilts.